Mayor Mandel on the warpath, keeps re-election plans secret. 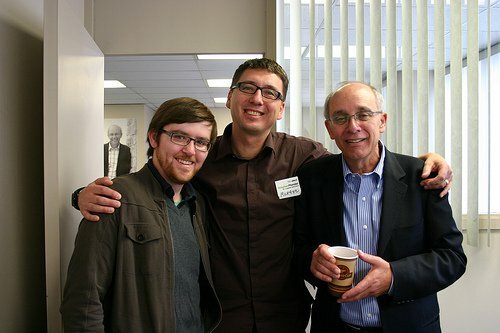 Yours truly, community organizer Michael Walters and Mayor Stephen Mandel at the Mayor’s campaign headquarters during the 2010 election. Stephen Mandel is not ready to announce whether he will run for a fourth-term as Edmonton’s Mayor. Speaking to a crowd of more than 2000 people at his annual state-of-the-city address to the Chamber of Commerce, Mandel avoided the topic of his political future, instead taking aim at Premier Alison Redford’s Progressive Conservatives by criticizing recent deep cuts to post-secondary education budget. Mayor Mandel also called out the Tories for their lack of commitment to the promised City Charters and cuts to municipal infrastructure funding. It was a big shift for a Mayor who has spent his time in office influencing his provincial counterparts behind the scenes, rather than through the media. 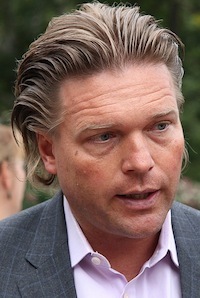 The always-eloquent Deputy Premier Thomas Lukaszuk was in the audience at the Mayor’s announcement and responded by telling the media that, “I don’t know who pissed into his corn flakes…” He might be #2 in the halls of the provincial legislature, but Minister Lukaszuk was vastly outnumbered in that banquet hall yesterday afternoon. For all his faults, Mayor Mandel is still incredibly popular among Edmonton’s business community – a powerful constituency in the electoral coalition that re-elected the Tories in 2012. With the Mayor on a new warpath, political watchers who were expecting the Mayor to announce his plan to retire in yesterday’s speech will have to wait (perhaps four more years if he decides to run again). If Mayor Mandel decides to retire, this October’s vote will be the first mayoral election since 1968 without an incumbent or interim mayor on the ballot. Edmontonians have witnessed considerable growth in their city and progress on projects like downtown redevelopment and public transit expansion since he became Mayor in 2004. He will be a hard act to follow. Mayor Mandel’s potential retirement has sparked wild-rumours and serious-speculation about who could run to replace him. While none have officially declared their candidacy, all eyes could soon focus on the handful of City Councillors who could stand to become the next Mayor of Edmonton. 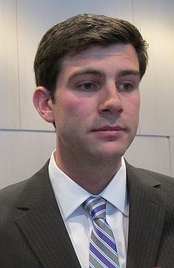 As an underdog candidate in the 2007 election, Don Iveson surprised political watchers when he unseated high-profile Councillor and past mayoral candidate Mike Nickel in south Edmonton’s Ward 5. Since then, Councillor Iveson has been one of Council’s most well-spoken and thoughtful voices on issues ranging from smart growth to waste management. His role as chair of the Capital Region Board’s Transit Committee will have given him an opportunity to understand the broader needs of Edmonton’s neighbours. Don Iveson represents a new generation of politically engaged Edmontonians who are passionate about defining Edmonton as a strong economic and creative hub in Canada. A popular and hard-working representative, Karen Leibovici is one of Edmonton’s longest serving politicians. 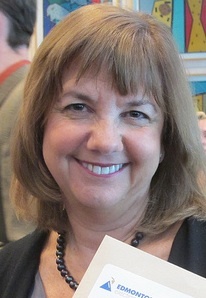 She began her elected career as a Liberal MLA representing the Edmonton-Meadowlark constituency in 1993 and was elected to City Council in 2001. While she once wanted to lead Alberta’s Liberal Party, her politics have tended to be more conservative on civic issues. Councillor Leibovici is currently finishing her term as the President of the Federation of Canadian Municipalities, the national lobby group for Canadian municipalities. Serving his second-term representing Mill Woods, Amarjeet Sohi is a consummate retail politician and community advocate. On Council, he is a passionate voice for an area of Edmonton that has been traditionally underrepresented in the halls of power. 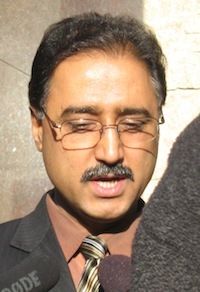 A former representative with the Amalgamated Transit Workers Union, which represents Edmonton Transit Service staff, Councillor Sohi is one of the most down-to-earth politicians you will find in this city. First-term Councillor and former Edmonton Sun reporter Kerry Diotte has made his mark over the past two years as City Council’s resident contrarian on issues ranging from bike lanes to the proposed downtown arena. Tapping into widespread frustrations about the state of city roads, Councillor Diotte recently launched the gimmicky “hole-y-cow” contest to encourage Edmontonians to report potholes for a chance to win a $500 gift certificate. While he has been outspoken critic on city council, it is sometimes difficult to figure out what vision Councillor Diotte actually has for Edmonton. Whether these Councillors run for Mayor in October depends on many factors, including the big question of whether Mandel will decide to seek re-election. Following yesterday’s speech, we may have to wait a while for Mandel to give us an answer to that big question. Stay tuned. 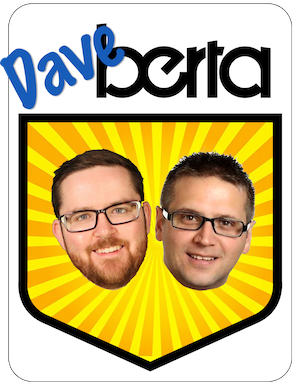 This entry was posted in Alberta Politics and tagged Alison Redford, Amarjeet Sohi, Don Iveson, Karen Leibovici, Kerry Diotte, Mike Nickel, Stephen Mandel, Thomas Lukaszuk on April 3, 2013 by Dave Cournoyer. I’m tremendously impressed by the Mayor’s passionate defence of higher ed today, and grateful for it. Wow. While I agree with Mandel’s comments regarding university funding, I don’t believe for a second he is prepared to go to the wall over it. This is an attempt to blackmail Redford over the arena. He’s telling her she can be taken out in the leadership review, and he will lead the charge if she doesn’t give him the $100 million for the new arena. Great article and assessment as usual Dave! I seriously would not think that the Mayor is so callous, inhuman and indifferent to the hacking of healthcare and hacking of education, that he would gave the audicity to ask for arena money. I absolutely think that the Mayor is an honest and fair person that is incapable of even thinking anything so horrible so as to think even one red cent of Provincial Coffers should go to arena, over healthcare and education for an entire province, given we are billions in Debt. Who ever accused the Mayor of such a thing should apologize. Thank you Art. Mandel can dress it up with student outrage and pothole pain but once again he is just upset about his arena. Big talk about infrastructure when he’s ignored it for the most part to focus on adding bullet point projects to his resume. I think he’s a piece of #2 wherever he is.